If you aren’t a Google Chrome user, then you should be alarmed at the rate of its market share rise. When it comes to web browser market share, there are two that you need to worry about. One of them is for the mobile browser, and the other is for the desktop browser. You shouldn’t be too surprised that Google Chrome does well on mobile phones since Google owns Android and so they install the Google Chrome web browser on Android before they let manufacturers and carrier networks play with it. A manufacturer then has the option of creating a unique browser experience before they sell the phones and many of them do that (Samsung does, for example.) That certainly takes away many would-be Google Chrome users, but Google Chrome still performs pretty well on mobile. But where the real surprise lies is with desktop web browser statistics. The Google Chrome browser is rapidly rising and taking over the market share on desktops. I’ve mentioned the obvious reasons for that many times before in other articles. But basically, it comes down to Google owning YouTube and Google, of course, owning the Google search engine. Both of those websites get massive amounts of traffic every day, and both of those sites have a pop-up notification promoting Google Chrome. If you choose to deny installing Google Chrome, then you’ll get the same notification the next time you visit Google or YouTube, and the next time, and the next time, until you eventually cave in and choose to install it. That doesn’t mean that Google Chrome has been installed on a lot of computers and isn’t being used though because the usage statistics are based on views on web sites coming from a particular web browser, so the statistics are always based on how many people are using the browser and not how many people have installed the browser. So, lets dig a little deeper into the facts: Peter Bright from ArsTechnica—one of the largest tech news sites in the world—reports that in the beginning of 2016, Internet Explorer was still the most commonly used web browser in the world. After following that figure up, I can concur that Peters report is correct. You can see a graph on how the market share for web browsers has changed since the beginning of 2015 and today provided by NetMarketShare. According to W3 Counter—one of the world’s few reliable websites that does nothing but monitor web statistics—Google Chrome is now being used on over 62% of web traffic views. You can also see a similar figure available from the NetMarketShare website from the link given above. There are small differences between the statistics depending on the source, but they all say the same thing: we are seeing massive shifts in who the browser powerhouses are, and Google Chrome is treading in the right direction. Some underlying factors have contributed to Microsoft’s demise, including the fact that they chose to rebrand Internet Explorer entirely and create a new web browser called Microsoft Edge. 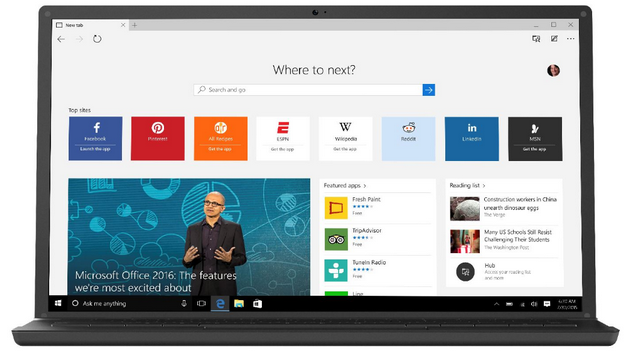 The Microsoft Edge web browser is only available in Windows 10. There are still lots of people using older versions of the Windows operating system (as well as older operating systems not made by Windows), and thus nobody can use Microsoft Edge from those devices. So, if IE didn’t get rebranded as Edge in Windows 10, where would a Microsoft-owned web browser stand against the competition? The answer to that question is that it likely still would have met its demise, and the figures of Google Chrome’s dominance comes down to more than just Internet Explorer no longer being the browser that Microsoft wants you to use. If you look at the figures of users who use Microsoft Edge on Windows 10, plus all of the people who use Internet Explorer in older versions of Windows/Internet Explorer in Windows 10, Google Chrome still comes out the winner in market share. There’s no reason why people would not be using the default web browser that Microsoft offers in Windows 10 any less than they were used in older versions of Windows when they started using Internet Explorer. What does that mean? There are other reasons for Internet Explorer and Microsoft Edge losing its popularity that need addressing. People are becoming more tech savvy and now understand that there is more than one web browser on offer, instead of just assuming that Internet Explorer is the portal to the internet when people use Windows. The dominance of Google as a search engine and YouTube as a video sharing website are also starting to become huge factors in what web browser people use. If that is true, then what could Microsoft do to swing user back into their favor? The Windows operating system is still by far the most dominant operating system in the world. Mac hardly is even worth mentioning if you look at the overall usage statistics between Windows and Mac. If Microsoft wanted, it could quite easily use that to its advantage. Microsoft kind of already has started with a similar idea of making Microsoft a more suitable web browser of choice for people who use the Windows operating system. They pushed the thought that Microsoft Edge was a faster and less power consuming that Google Chrome and Mozilla Firefox last year, for example. The differences were also apparent: I could tell the difference in speed when browsing Microsoft Edge and Google Chrome on my domain, and I know a lot about assessing site speed. Edge was faster in Windows 10, and it still is. Edge is the equivalent of using Chrome without any browser extensions–and it still might be faster than that again. Web browser speed is probably the number one thing that people care about, but as we head into the future where more and more people are using devices, the battery draining less using Microsoft Edge than Google Chrome could also be a deciding factor in what web browser people choose to surf the web. Battery technology isn’t advancing very quickly, and we’ll likely still be facing the same battery issues with laptops that we face today: you only get a certain amount of uses before that battery needs replacing and the you’ll need to keep buying new batteries to keep it working. The more power efficient Microsoft can make the web browser over its competition, the less people like you and me need to recharge and the longer the battery can sit in a laptop without needing to be replaced. No brainer, right? There’s more. If you don’t care too much about having to buy a new battery, wait for it to get delivered, and then insert it into the back of your device, you might care about just keeping your device charged up for longer. If you’re anything like me, you’ll need to use a laptop without it being plugged into any power source every once in a while because there isn’t power cable in a convenient enough of a location for me to want to use it—it will cause too much of a hassle and distraction to my work. So, an important thing to me is making sure I have a laptop that has a battery that lasts a long time between charges. Microsoft should always have what it takes to manipulate things to a point where the default Microsoft web browser is a more power efficient web browser to use when you use it with their operating system. Additionally, they should also have the chance to make their web browser faster when people use it on their operating system. The question will be will they want to go to that kind of length to hurt the competition by deliberately making life difficult for them and I believe the answer is probably a yes—in the long run. The panic is near. In addition to the power consumption and speed advantages that they should give themselves over the competition, there are some aesthetical issues that I don’t enjoy when I use the Microsoft Edge web browser. When I open my web browser, I like having the address bar at the top of the computer’s screen. Microsoft Edge seemingly has tried to do something new instead of the same old browser address bar at the top, and they’ve put it closer to the middle of the screen. That one reason alone is why I—and I’m sure many other people (particularly those who are accustomed to already using Google Chrome)—don’t use Microsoft Edge as much as I otherwise would. Something else that I know many people don’t like about Microsoft’s web browsers, whether it be Edge or the older Internet Explorer, is that websites tend to look a little bit funny when you view them. If you were to view ConsumingTech from Google Chrome and then open up Edge and view it again, you’d notice a distinct difference in the why the fonts look, the way the colors are presented, and frankly, the advantage is in Chrome’s favor. Things look better from Chrome. Why that probably falls outside of my understanding of developing, but it is a noticeable difference on the eye. Another thing that hasn’t gone unnoticed as a website owner is how little support Microsoft Edge offers to sneak peak at developing. The average user might not care, but hundreds of thousands—if not millions—of people around the world make use of a feature that Google Chrome has where you can right-click an item and choose to inspect its element. That then allows you to do things like getting a website’s code they are using if you wanted to try to sample some of it too or check out what fonts that are using, so forth. Edge offers nothing in that regards, at least not by right-clicking. The right-click context menu in Edge provides very little at all, in fact. Was Microsoft Edge a little hard done by? I think it probably was. If you look at the numbers, far more people have made the switch from an earlier version of Windows to Windows 10 than they have from Internet Explorer to Microsoft Edge. That means people are upgrading to Windows 10 and then choosing to leave a Microsoft-owned web browser for something else such as Google Chrome. Could there be a reason for that change other than people just not wanting to use Edge? There is one thing that I’ve picked up on when I open Microsoft Edge from a new copy of Windows 10, and that is a new pop-up from Google asking if I want to make the Google search engine my default search engine. If I agree to do that, I then get another message from Google asking me telling me to “Go get Chrome.” We don’t have the statistics that tell us how Google Chrome is getting so many of its users, but if we were to guess, we’d say that this one here is the main one. When people open the default Edge browser when beginning to use Windows 10, they immediately get a message from Google asking them if they want to set Google as the default homepage instead of Bing. A heck of a lot of people prefer Google search over Bing, so they agree to follow the steps to do that, and then they are greeted with a message telling them to “Go get Chrome.” That is then their gateway to beginning to use Google Chrome and never to look back. So what could Microsoft do to solve this problem? There are a couple of things that Microsoft could do to solve that problem. Firstly, they should improve the search results from their Bing search engine. As a website owner—and owner of lots of great content—it blows my mind to see where my stuff ranks in Bing. Bing just has absolutely no clue what is great content and what isn’t. It’s almost like it doesn’t even try to assess what is great content; it solely relies on being told what is great content. Google is nowhere near as bad as that. Google still relies on being told what is great content, but it also tries to assess content itself, and it’s not uncommon to get views for something from Google even if there are no other factors in play other than just our great content. That never happens in Bing. The other thing that Microsoft could do is concede the homepage to Google by default. Don’t offer Bing at the beginning of the Microsoft Edge experience. Just open it up to Google instead and then Google can’t deliver a message asking if you want to make Google your default search engine. And if they can’t do that, then they also can’t use that as its gateway to getting people to install Google Chrome.